Santa Cruz, CA, October 28, 2014 – Fifteen Jewish and education advocacy groups, today, wrote to the presidents of more than 100 universities with Students for Justice in Palestine (SJP) chapters to warn them of an internal SJP document containing a strategy for disrupting pro-Israel student events, conduct subject to prosecution under state criminal laws. In 2010, 10 students were convicted for disrupting Israeli ambassador Michael Oren’s speech at the University of California, Irvine. The disruption of on-campus events violates New York State law. Sec. 240.20 of the New York Penal Law outlaws “disorderly conduct,” which includes “without lawful authority,…disturb(ing) any lawful assembly or meeting of persons.” All U.S. states have similar laws restricting the disruption of public events if this same tactic were to be employed by other SJP chapters. Earlier this fall, many of these same groups wrote to more than 2,500 U.S. colleges and universities urging them to protect Jewish students on campus in light of rising antisemitism in America and abroad. In particular, the letter raised concerns over SJP, which the signatories note has a history of “harassing and intimidating Jewish students.” The letter cited several recent incidents, including one at Temple University in which a pro-Israel student was physically and verbally assaulted by SJP members, as well as SJP’s planting of anti-Israel mock eviction notices under students’ dorm rooms on multiple campuses. Today’s letter and a letter to the president of Binghamton University are below. 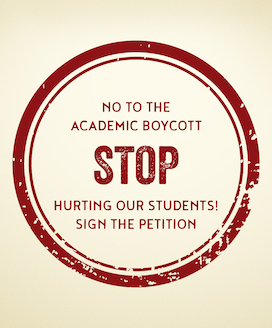 The AMCHA Initiative is a non-profit organization, based in California, dedicated to investigating, documenting, educating about, and combating antisemitism at institutions of higher education in America. AMCHA Initiative’s efforts are bolstered by a network of more than 5,000 members and supporters of the Jewish community — including university alumni, parents and grandparents, rabbis, religious school principals and synagogue members — who have joined together to speak in one voice to ensure the safety and well-being of Jewish students on college and university campuses across the country. Last month, you received a letter from 14 organizations informing you about some of the anti-Semitic harassment and intimidation tactics employed by the group Students for Justice in Palestine (SJP), and urging you to take adequate steps to ensure the safety of Jewish students on your campus. As a follow-up to that letter, we would like to inform you of a troubling revelation about one particular SJP chapter that may be relevant to the safety and well-being of Jewish and pro-Israel students on your own campus. A foundational document of the SJP group at Binghamton University, entitled “Declaration of Principles and Strategies,” recently came to our attention. The document is extremely troubling in that it outlines a clear strategy for targeting, ostracizing, harassing, and silencing students on campus who oppose the boycott of Israel or who support or simply attend a program or event with which the SJP disagrees. In a section entitled “With Regards to SJP’s Interaction with Zionist Student Organizations,” the document prohibits SJP leaders and members from collaborating or cooperating with specifically-named Jewish and pro-Israel student organizations, as well as with any group that has “aided and abetted Zionist student organizations.” Although a student organization is certainly free to choose its partners for collaboration and cooperation, the SJP group’s a priori rejection of any interaction with Jewish and pro-Israel student groups – or with any other group that is deemed to have “collaborated” with them – bespeaks of prejudice, bigotry, and a lack of tolerance and civility, behavior that should not be tolerated from a student group on any campus. Far more troubling, however, is the section of the document entitled “With Regards to Tactics and Strategies Used to Counter Zionist Normalization,” which spells out a strategy for not only protesting certain student events, but also for actually disrupting them, simply because the SJP disagrees with the views that might be expressed there. In calling for the disruption of other student groups’ events, the SJP group is advocating behavior that violates Binghamton’s Student Code of Conduct, and may well be inciting criminal conduct in violation of New York State law prohibiting the disturbance of a lawful meeting or event. 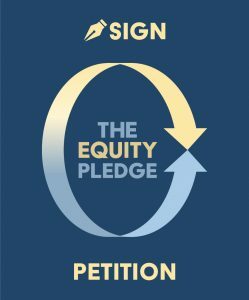 We are bringing this document to your attention because it advocates behavior consistent with “anti-Zionist normalization” campaigns being waged by SJP groups across the country, whose explicit purpose, according to the Anti-Defamation League, is to delegitimize all pro-Israel perspectives and actively suppress their expression on college campuses. These campaigns have resulted in dozens of Jewish and pro-Israel students’ events being disrupted, and Jewish and pro-Israel students feeling harassed, intimidated, and stripped of their constitutionally-protected freedom of expression and association. (See HERE for a sample of Israel-related events that have been disrupted by SJP students on more than 20 U.S. campuses). Moreover, if members of the SJP orchestrated a disruption of a campus event, such conduct could subject them to prosecution and conviction under state criminal laws – which is precisely what happened to members of the anti-Israel student group at the University of California, Irvine after they carried out their plan to disrupt a speech by Israel’s then-ambassador to the U.S.
We therefore urge you to carefully monitor the behavior of the SJP group on your campus and to ensure that its members’ conduct conforms to university policy and the law, and that the group does not threaten or infringe on the rights of other members of your university community. We represent 15 organizations with hundreds of thousands of members and supporters nationwide, who are deeply concerned for the safety and well-being of Jewish students on campuses across the country. We have particular concerns about Jewish students on your campus, based on the marginalizing, intimidating and bigoted tactics that we have reason to believe may be used against them by Students for Justice in Palestine (SJP), a student group established at Binghamton University (BU) less than one year ago. We were recently made aware of an on-line document entitled “Declaration of Principles and Strategies”. The document purports to be “a collection and elucidation of several resolutions and collective decisions formulated and approved by the membership of Binghamton University Students for Justice in Palestine.” It outlines “principles and strategies” generally agreed upon by the BU SJP membership. As a foundational document of a student group at your university, the “Declaration of Principles and Strategies” is extremely troubling. The SJP’s document outlines a strategy for targeting, ostracizing, harassing, and silencing students on your campus who oppose the boycott of Israel or who support or simply attend a program or event with which the SJP disagrees. In a section entitled “With Regards to SJP’s Interaction with Zionist Student Organizations,” the document prohibits SJP leaders and members from collaborating or cooperating with eight specifically-named Jewish and pro-Israel student organizations. Going further, the “Declaration” prohibits collaboration even with any group that has “aided and abetted Zionist student organizations.” The SJP’s goal is crystal clear: to single out Jewish and pro-Israel student groups, isolate them, and cut them off from other student groups in the university community. In addition, while acknowledging First Amendment freedoms, the Code rightly makes it clear that those freedoms cannot be exercised at the expense of the rights of others, noting that ”abusing the rights of any one person or group ultimately endangers the rights of all.” Accordingly, the Code specifically prohibits “disorderly or disruptive conduct that interferes with the normal operations of the University or infringes on the rights of others” – exactly the kind of conduct that the SJP is apparently encouraging its members to engage in. The SJP’s apparent plans at BU are already being carried out by this group on campuses across the country, resulting in dozens of Jewish and pro-Israel students’ events being disrupted and causing these students to feel harassed and intimidated. (See HERE for a sample of Israel-related events that have been disrupted by SJP students on more than 20 U.S. campuses.) According to the Anti-Defamation League, the explicit purpose of the SJP’s “anti-Zionist normalization” campaigns is to delegitimize all pro-Israel perspectives and actively suppress their expression on college campuses. (See http://www.adl.org/israel-international/anti-israel-activity/c/anto-normalization-campaign.html). We urge you to review the SJP’s “Declaration of Principles and Strategies” and consider the implications if they are carried out on your campus. Given the alarming upsurge in anti-Semitism around the world and right here in the U.S., it is crucial that the behavior of this group be carefully monitored. We urge you to ensure that the SJP upholds BU’s goal of diversity and inclusiveness, that the group’s conduct conforms to university policy and the law, and that the SJP does not threaten or infringe on the rights of other members of your university community.